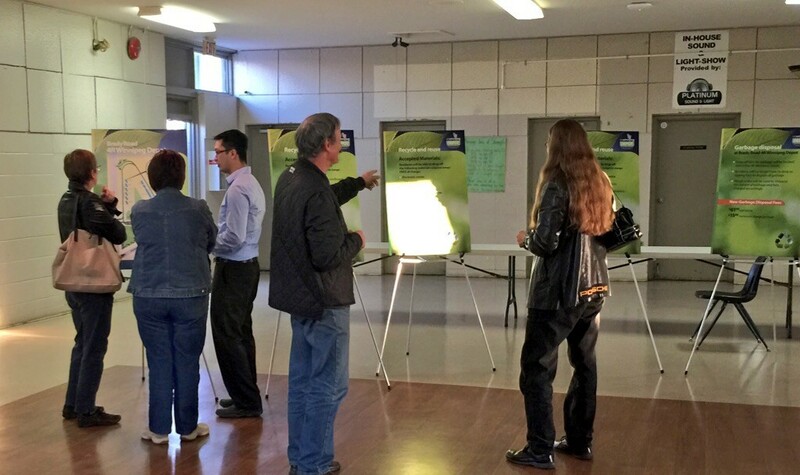 The City of Winnipeg hosted an information session regarding the Brady Road Resource Management Facility at the St. Norbert Community Centre Thursday evening (October 22, 2015). Displays were set up showing recent improvements to the landfill and plans for the future. To view the displays, visit Brady Road Open House Storyboards. For more information, visit Future of Brady Road. It opened in 1973 and is expected to have a lifespan of approximately 100 years. It’s Manitoba’s largest landfill at about 790 hectares, roughly the size of River Heights. Landfilling operations are gradually moving south away from the south Perimeter and away from the South Pointe residential area. That community continues to voice their concerns regarding the smell. Darcy Strandberg is with the City’s Solid Waste Division and tells 680 CJOB over the past year they have begun landfill flaring. “That’s reducing the odours at Brady Road through the reduction of methane converting it to CO2 (Carbon Dioxide),” Strandberg said. The system involves several wells dug into completed landfills. The gas is sucked through underground pipes towards a flare. The methane is then burned at over 800°C. Carbon dioxide, which is a less-harmful gas is produced. The City says annual greenhouse gas emissions are reduced equivalent to the emissions of 21,700 passenger vehicles. The landfill is also installing bio-filters on manholes to control excess odour. South Winnipeg-St. Norbert City Councillor, Janice Lukes believes the odour is well controlled. However, she is not convinced about the Samborski composting business a little further north off of McGillivray Blvd in the RM of MacDonald. “I’m not sure what their regulations are regarding their license, but the city is doing everything it can to maintain the smell,” Lukes says. Samborski was investigated late last year by the province after receiving hundreds of odour-related complaints . Lukes says if Winnipeggers do have issues with the smell, they should call 3-1-1. Brady Road also unveiled plans for a ‘one-stop shop’ where materials can be dropped off that can be recycled, reused, composted or resold. The facility will accept items that cannot be tossed in a blue bin. “With the opening of the 4R depot you can start bringing in your electronic waste, your household hazardous waste, tires, batteries and motor oils,” Strandberg said. It is expected to open later this year and be size of five football fields. The City continues to research an organic waste initiative. Other jurisdictions, including Brandon, have introduced a system to collect organic waste. He hopes to have report for City Council by next year. However, Lukes believes ultimately it will come down to cost.